In 2010, I wondered if there would be an anti-tech backlash. In 2011, I wrote a post on the future miracles promised by smartglass and wondered about the negative responses it received online - most memorably a Youtuber who saw a world of smartglass and pined, "I want to live in a stone cavern." In response, a reader accused me of being anti-tech: "Grow the hell up. You know the video is supposed to look perfect, right? Otherwise they wouldn't have bothered to make it. This is the future - go with it or get out of the way. You complain about this making us over-reliant upon technology and yet YOU'RE the one who spends hours and hours writing a useless blog giving your nobody opinion. Hypocrite much?!" Don't shoot the messenger. We cannot avoid technology now and we work with it. But if that is the kind of pro-tech hostility that greets a little blog post vaguely pondering anti-tech sentiment, don't expect tech to reach the next level of human integration without conflict. The danger that human beings could be split into warring camps between those who integrate technology into their bodies, and those who do not, seems never to have entered the heads of the lords of Silicon Valley. Steve Mann, the "father of wearable computing," has been physically assaulted while visiting a McDonalds in Paris, France. The Canadian university professor was at the restaurant with his family when three different McDonalds employees took exception to his "Digital Eye Glass" device and attempted to forcibly remove it from his head. Mann was then physically removed from the store by the employees, along with having his support documentation destroyed. This may be the first ever recorded assault of a person instigated by the prominent display of a Google Glass-like wearable computer. 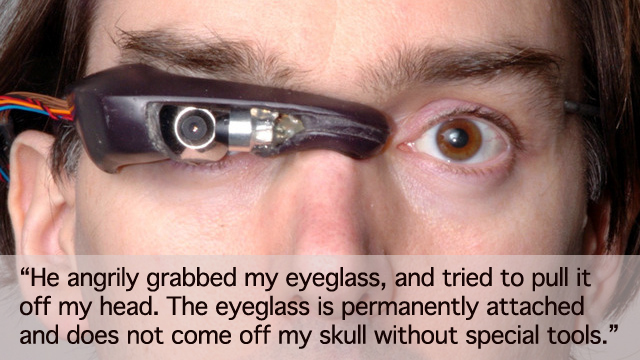 The incident is particularly troubling, not only because Mann's device is very similar to Google Glass, but because the assault could be a harbinger of things to come as the technology becomes increasingly prominent. Assaults such as this one may become more frequent should people (and corporations) respond poorly to the use of such devices. Details of the assault were made available by Mann on his blog. He, along with his wife and children, were touring the Champs Elysees area when the incident took place. After sitting down to grab a bite to eat, Mann was questioned by a McDonalds employee about the Eye Glass. Since Mann had spent the day going to museums and landmarks, he had brought a letter from his doctor along with other support documentation explaining the device. Three employees subsequently assaulted Mann in the restaurant and tried to tear off the eyeglass device he wears, which is fixed to his head. Was this simple theft, or an attack on Mann's strange looking cybernetic attachments? Mann evidently believes (as do other media outlets reporting the story, based on Mann's 16 July 2012 blog account of the Paris assault) that the employees directed their attack at the tech. I09 closes the report with comment that Mann has been targeted before for his wearable gadgets: "Mann is no stranger to controversy — nor to discrimination. He was once thrown out of a Wal-mart, and has had run-ins with the New York City Police department and U.S. Secret Service." Within hours of this story circulating on the Internet, there was a budding debate about the civil rights of cyborgs. Let us hope that cyborgs' enhanced abilities are not eventually viewed as a collective threat by those who do not follow cybernetic fashions. Discrimination? What, did they have a Cyborgs-only line and he was at a sit-in? come on. The guy is just an attention-seeker. Most people haven't got a clue what transhumanism is, let alone that the revolution is upon us. It's much more likely as these changes proceed, that wealthy well-connected well-educated early adopters like Steve Mann will walk all over lowly impoverished uneducated McDonalds employees for putting two splendas instead of one in their decafs. The Robocop arms aren't going to help balance things any, either. Yeah, 'discrimination' was not the line I took, but the angle that i09 took, and I suspect they got that viewpoint partly from the professor's blog. But I would not be surprised if some try to turn cyborg fashions into a civil rights issue, down the road.